Your Attention Please, San Pedro residents and friends of Casper Wood around the world. Our help is urgently needed. Casper (aka Fido’s bass player) has serious health issues and has recently had to quit working. He is in desperate need of a pacemaker and we hope we can all work together to help him get this much-needed operation as soon as possible. There is no time to waste. PLEASE JOIN US AT OUR FUNDRAISING-BENEFIT FOR CASPER WOOD, to be held at ABC Pub & Grub (located in front of Wet Willy’s on the corner of Sandpiper & Boca del Rio Dr.) on Saturday Nov. 22nd, from 1 p.m. ‘til 7. FOOD, RAFFLES, HAPPY –HOUR DRINKS & OF COURSE, THE BEST LIVE MUSIC ON THE #1 ISLAND DESTINATION IN THE WORLD! Here is an opportunity for many of us to pay it forward! To the countless musicians, friends and music lovers who have had the privilege and pleasure to play with and/or enjoy the music of Casper Wood, the time has come to show your generosity, your love and your appreciation for all he has given to us. Casper has consistently made a very important contribution to the night life in San Pedro Town. As the musical director at Fido's, he was in charge of hiring musicians and provided us with quality entertainment which included live music seven nights of the week. As an accomplished professional bass guitar player he was leader of the “house band at Fido’s” for many years. After many years of sharing his music with eager audiences and teaching his skills to beginners, Casper has made a very positive impact on the music scene in San Pedro. Our friend now needs our help in raising funds for urgent medical attention. Thanks to this man’s hard work, we were all guaranteed a place to go and hear quality live music any night of the week, year after year. A little history . . . Casper got hired at Fido’s on Halloween night, the first night he arrived in San Pedro with his wife Angela 10 years ago. 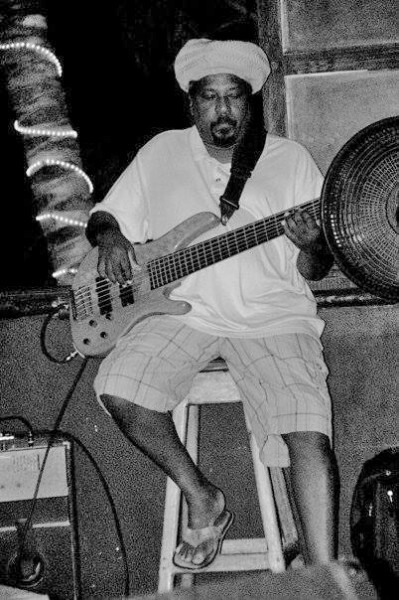 He was a professional bass player for many famous Jamaican reggae artists before that. He has toured all over the world with Apple Gabriel, Pablo Moses... and many other well-known recording artists! He has been playing music since he was 13 years old. Many people don't know this but he also plays drums and is a songwriter. Casper grew up in Panama but left as a youth to pursue his passion for music in the United States. From there he went on to travel in Europe, Africa, Asia, South America as the bass player for various Jamaican artists. He played at the very first famous “Reggae On The River” Festival. His band that backed up the artists were known as The Revolutionary Dream Band. Unfortunately, due to Casper’s enlarged heart, he was not able to tour anymore because the altitude when he flew started to give him problems. He has been taking medication for the last five or six years which is no longer effective. We hope he will get his pacemaker in time so he can live a normal life again!